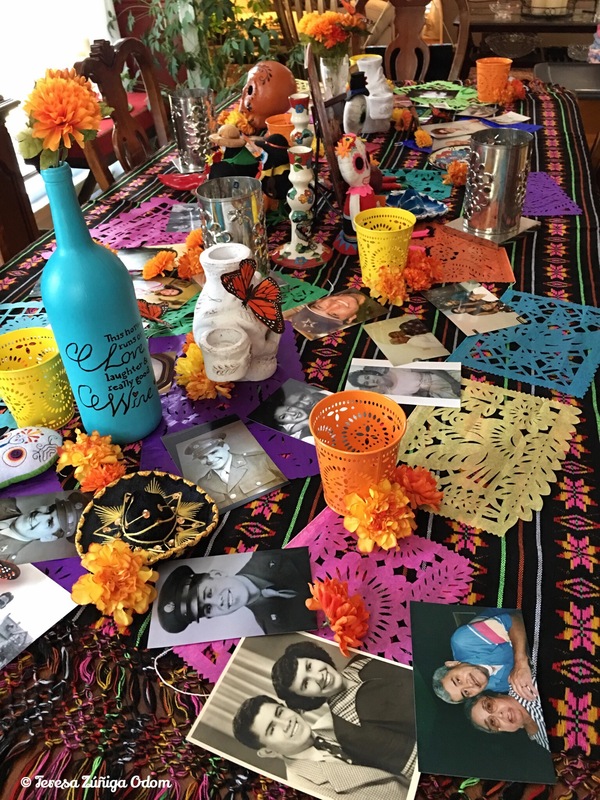 Alabama Dia de los Muertos Celebrates Quince Años! 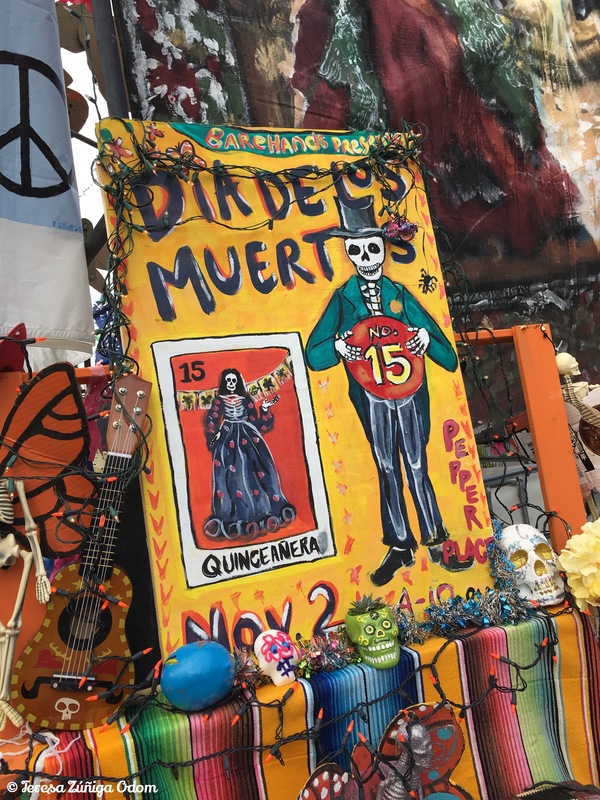 Dia de los Muertos celebrates Quince años! 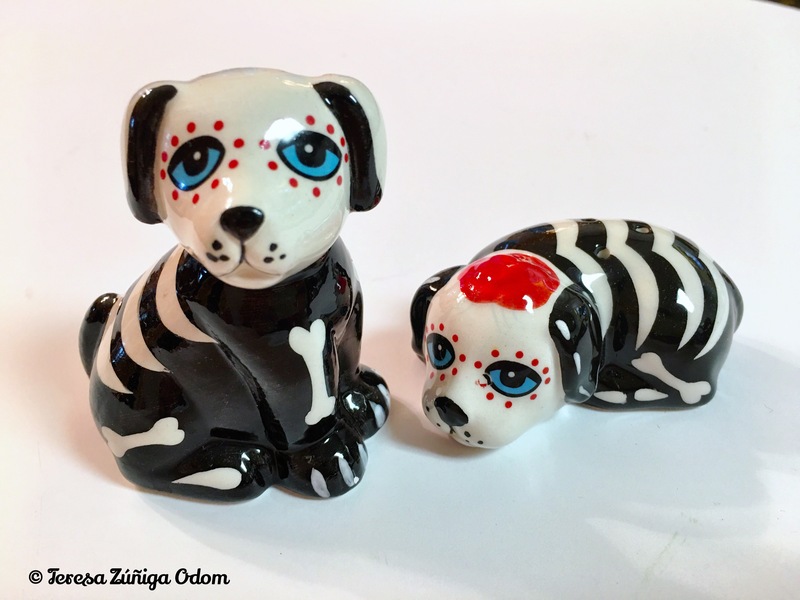 Dia de los Muertos Alabama, presented by Bare Hands Gallery, celebrated 15 years this year! I know I’ve said this before but I’ll say it again…after my beloved Fiesta, this is my second favorite festival of the year. Fiesta board members have always felt a kinship with DOD Alabama going back to our fifth year in existence. That was the year we “discovered” one another as each of our festivals grew and that was the year we decided to support one another. This festival has been looking for a forever home since it lost its original location last year due to the changes in the Birmingham landscape. The Rotary Trail was completed and it just wasn’t possible to use the same area for a festival this big. Last year, the festival temporarily moved to Cahaba Brewery and it was packed. After the crowd that showed up, they knew they needed more space so this year they secured Pepper Place for the event. The entrance was at 3rd Avenue South with sponsors lining the left hand side. A portion of 2nd Avenue South was closed off to house the main stage on one side and the food court on the other. The main altar site was in the middle between the two in a large parking area. It was so beautiful and reminiscent of the original location. Two large brick walls surrounded the space and were used to hang murals and other décor. Chairs were set up around the site with fire pits as was done in the old location. I can remember years when it was so cold that those fire pits were a God-send! Lights were strung between the walls and papel picado was everywhere! The Mercado was in the parking lot of Pepper Place and there were so many vendors with beautiful hand crafted items for sale! I wanted one of everything! I really liked this Wonder Woman mask! Little girl admires her face painted in the mercado area. This year, the set up allowed for more space and a better flow to all the event components. The event was crowded but there was more space to walk around and not feel like you were being walked on or constantly running into someone. Florals being used to set up this altar. People watching at DOD is always entertaining and I love the way more and more are painting their faces as sugar skulls and dressing up. They embrace this event and seem to take the time to understand the reason behind it…why it is important and why it exists. 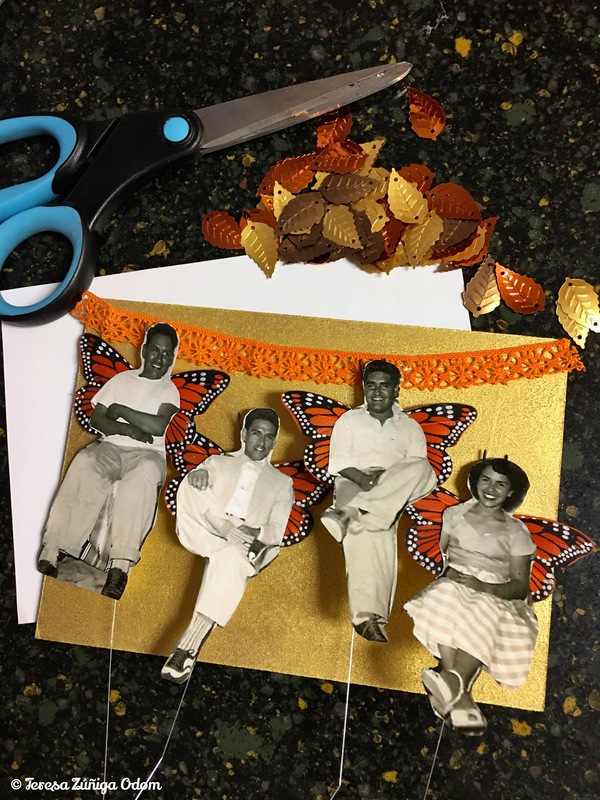 It’s not just a costume party, it’s a remembrance of loved ones who have passed on and a way to keep their memories alive for ourselves and a way to tell others about them. Here are some of my photos from last night…sometimes it’s just easier to tell the story with photographs. Meanwhile, happy Quince to DOD Alabama…it was a fabulous event! Viva la Vida! Tracy Martin during Flaco Jimenez’s performance! This entry was posted in Birmingham, Bloglikecrazy, Day of the Dead, Dia de los Muertos, Festival, Photography and tagged Bare Hands Gallery, Canon Photography, DOD Alabama, Pepper Place, Photography, Quinceanera, Sugar Skulls, Viva la Vida on November 3, 2017 by Southern Señora. A look at the skyline of Bare Hands Inc.’s Dia de los Muertos festival in its new venue – Cahaba Brewery this year. Murals of Spider Martin and Guillermo Castro are displayed at the start of the altar displays. 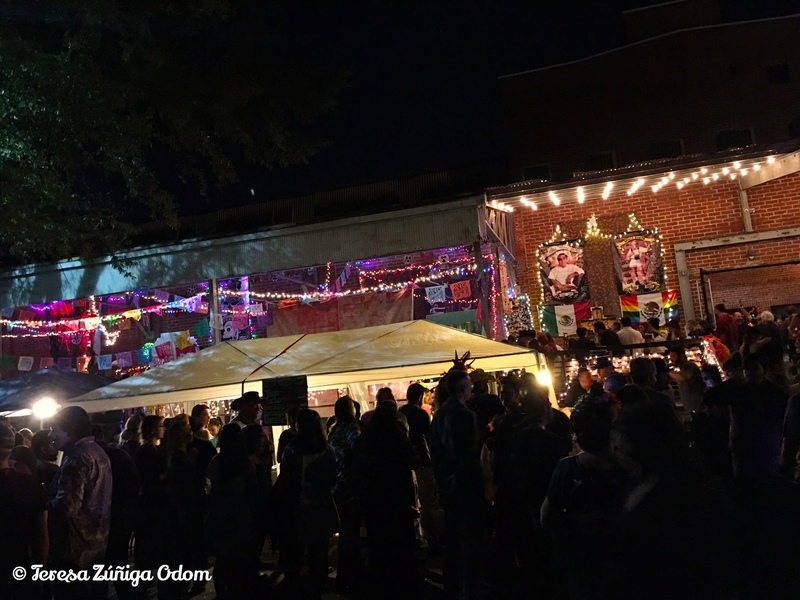 I’ve said this before – aside from my beloved Fiesta, Bare Hands Inc.’s Dia de los Muertos festival is one of my favorites of the year. Both just celebrated year 14 and both will celebrate their 15th – or Quinceanera – next year. For a festival to make it that long is impressive and this year was even more so for DOTD Alabama. Early in the year, I heard the festival had been cancelled. They had lost their long time location due to some changes in the geographic region and had also gone through some leadership changes with the retirement of long time ED Wendy Jarvis and installation of new ED, Robert Hernandez. But like any organization with volunteers who have a passion for what they do – they persevered and several months into 2016, they decided the show would go on (as they say) and partnered with Cahaba Brewery to move the festival to Avondale. And what a move! The festival drew over 6,000 people this year! As I was leaving at 8:30 I ran into Robert and Festival Director-Jennifer Gowers and their faces said it all… Jennifer grabbed me and said “where are all these people coming from? !” We looked at the entrance and people were still streaming in and the festival opened at 4 p.m. After a group hug, we talked about the incredible turnout and all the hard work it took to pull the event together in a shorter period of time. Incredible is the only word I could think of at that moment. Labor of love is the phrase I choose now. 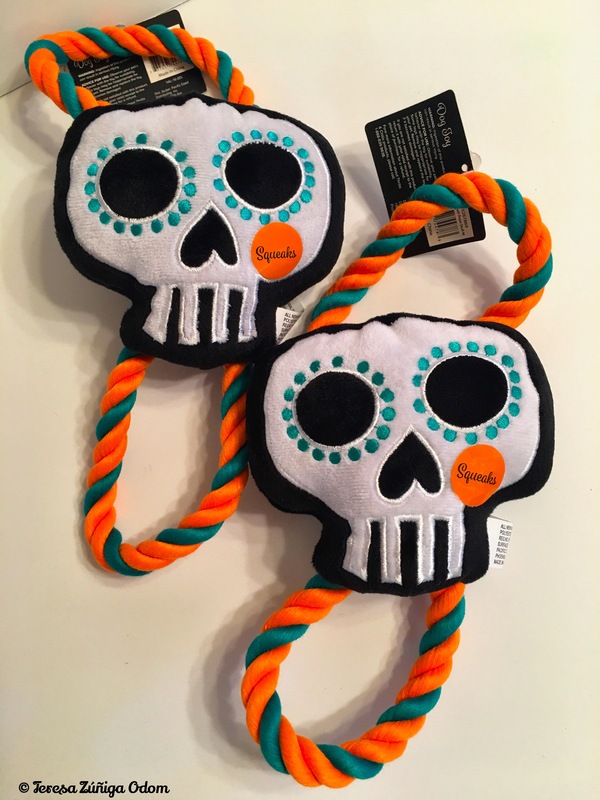 That’s what Day of the Dead/Dia de los Muertos means…that’s what Robert, Jennifer and the rest of the board members and volunteers accomplished this past November 2nd. Viva la Vida!!! Artist Julianna Jackson poses with her incredible headpiece in the DOD Market. The creations at her booth were exquisite! 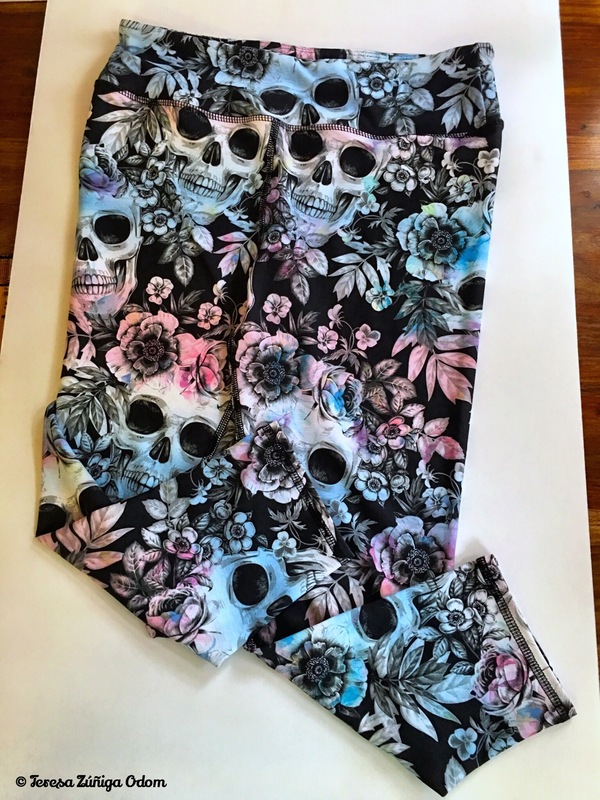 This entry was posted in Bloglikecrazy, Day of the Dead, Dia de los Muertos, Festival, Mexican, Photography and tagged Bare Hands Inc., Blog Like Crazy, Cahaba Brewery, Day of the Dead, Dia de los Muertos, Jennifer Gowers, Julianna Jackson, Robert Hernandez, Wendy Jarvis on November 6, 2016 by Southern Señora. 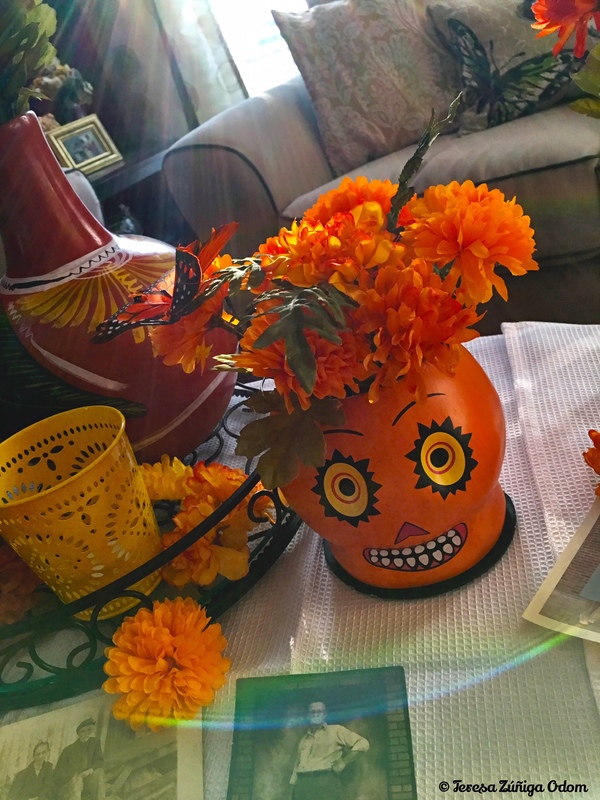 I started working on my Day of the Dead altars this weekend. 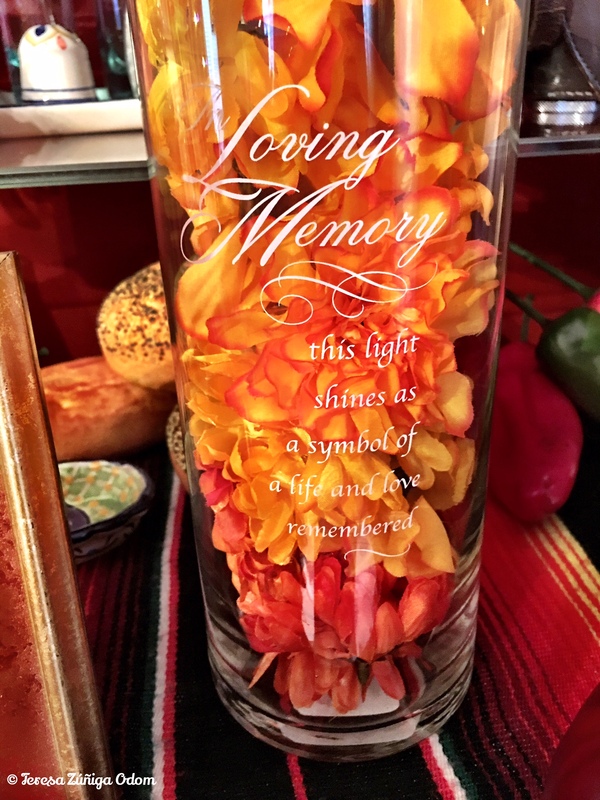 It’s always a special time deciding on the perfect way to display the memories of loved ones who have left us. Then I head to the basement to pull out my DOD boxes which takes a bit more time these days with all the new items I’ve added to my collection over the years! But I do love going through the boxes and seeing what will work to enhance the beauty of the altars and memories. 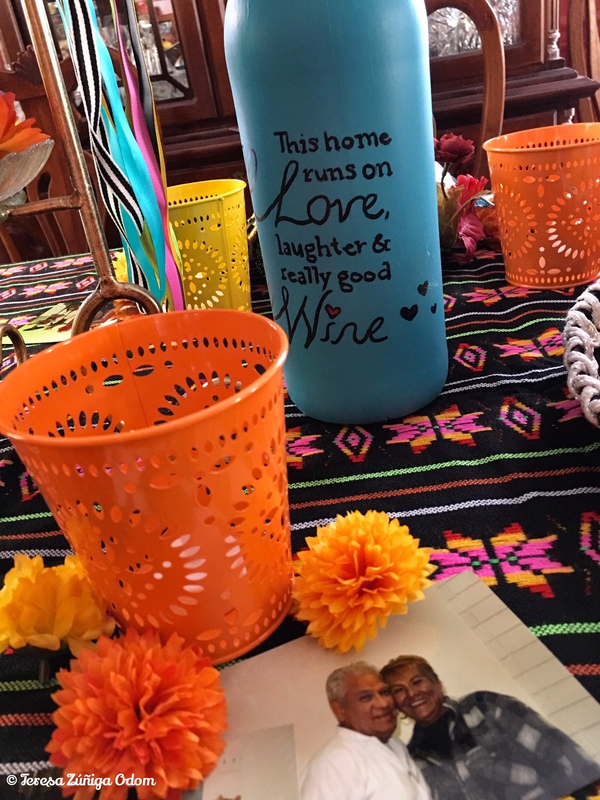 Papel picado tins from Target will hold tealight candles for Day of the Dead. 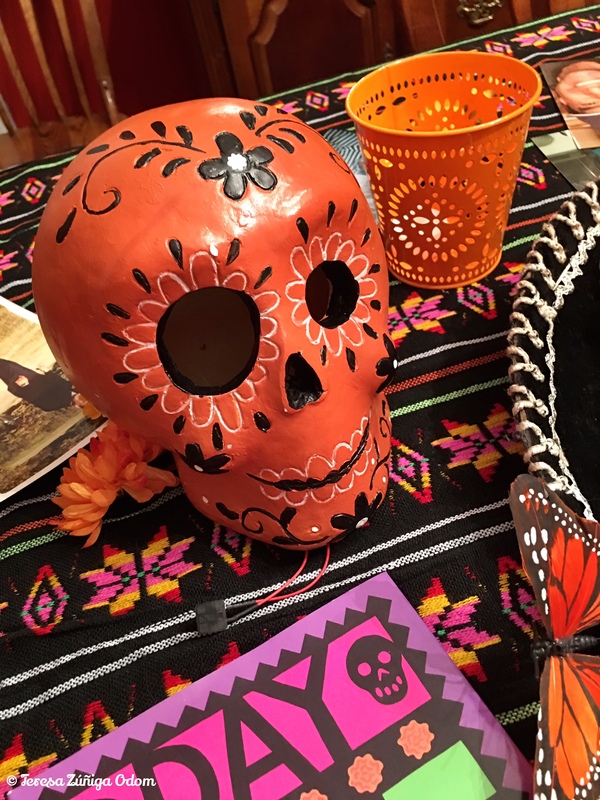 The blue bottle was hand painted by my daughter Emily – the other side sports a sugar skull. The photo on the bottom is of my dad and his niece Christie. Mariachi hats were another addition this year. I found to child mariachi hats at the Alabama Thrift store earlier this year. I couldn’t believe my good fortune. These hats are not cheap and they are in excellent condition. I knew I would use them for something and when I started pulling my altars together, they just worked. In addition, my mother gave me three miniature mariachi hats for my birthday in February, so those were also added. One day I hope to add a full size mariachi hat to my altar. I can already envision what it will look like! Finally, while I was in At Home a few weeks ago, I spotted a terra-cotta sugar skull as I was about to leave the store. So many of the DOD items you see these days are a little too mass-produced looking. I guess that’s why you can find them everywhere. But this one was different…and so if there was one, there had to be another! So I set out to search the store for one and I spotted it – out of sight in the Halloween section. Perfect! They look great on my dining room table! Photos on the Stone and Weaver family altar…these old photos are additions this year of my great-great-grandfather and his family! Tomorrow night, I will light the candles and photograph the glow of the altars. 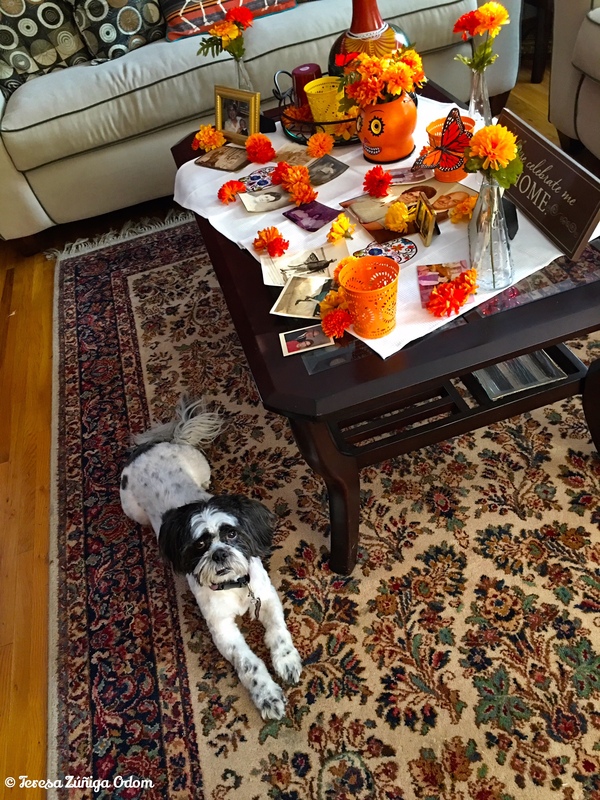 Then I will sit in my living room and reflect on the lives represented on these altars and give thanks for each and every life. 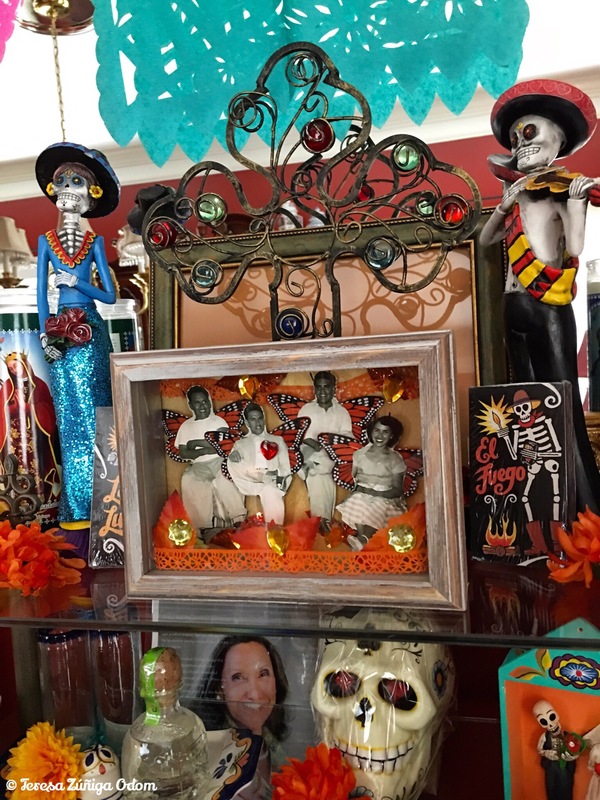 This entry was posted in Dia de los Muertos, Mexican, Zuniga Family and tagged Altars, Day of the Dead, Dia de los Muertos, Familia, Mexican, Viva la Vida on November 2, 2016 by Southern Señora. 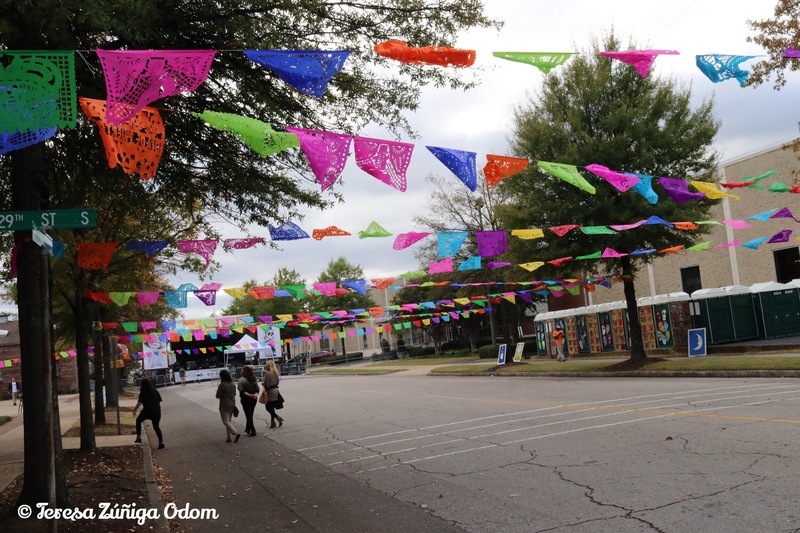 Birmingham’s annual Day of the Dead Festival, organized by the nonprofit Bare Hands Inc., was Monday, Nov. 2 in downtown. 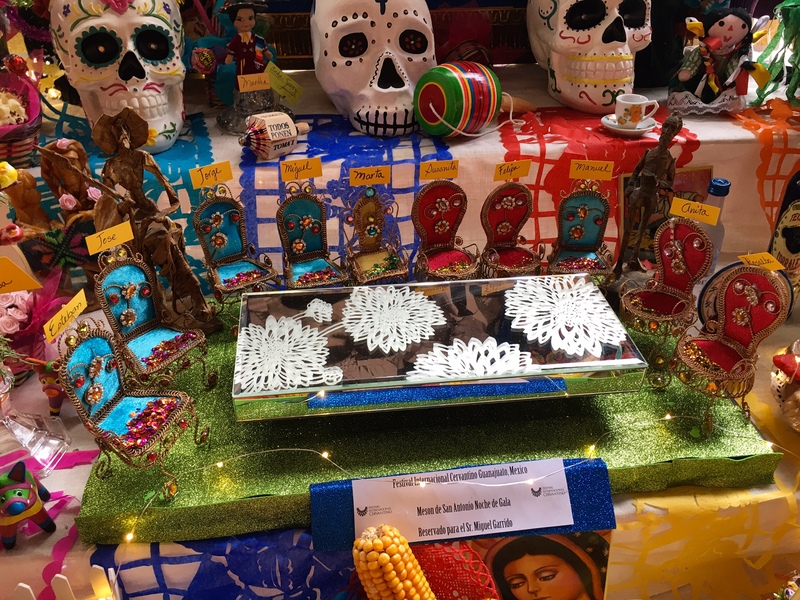 This was the 13th year for the festival that celebrates the lives of departed loved ones with lively celebrations, food, music, flowers, dancing and stories. The event has grown in popularity in recent years and continues to expand, drawing a diverse crowd. 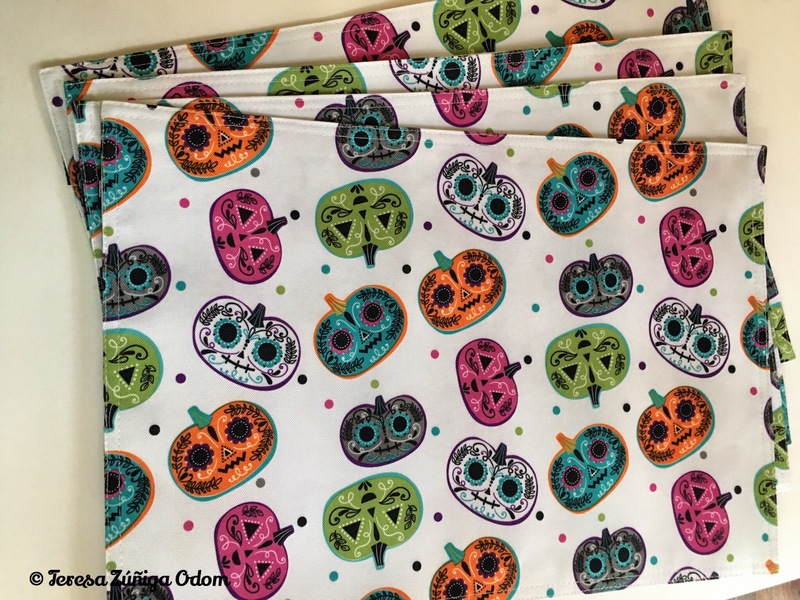 Day of the Dead, or Dia de los Muertos, is a Mexican tradition that celebrates life rather than mourning death. The day coincides with the Catholic celebrations of All Saints’ Day (Nov. 1) and All Souls’ Day (Nov. 2). Many people describe this event as a colorful, vibrant and joyful commemoration rather than something somber. 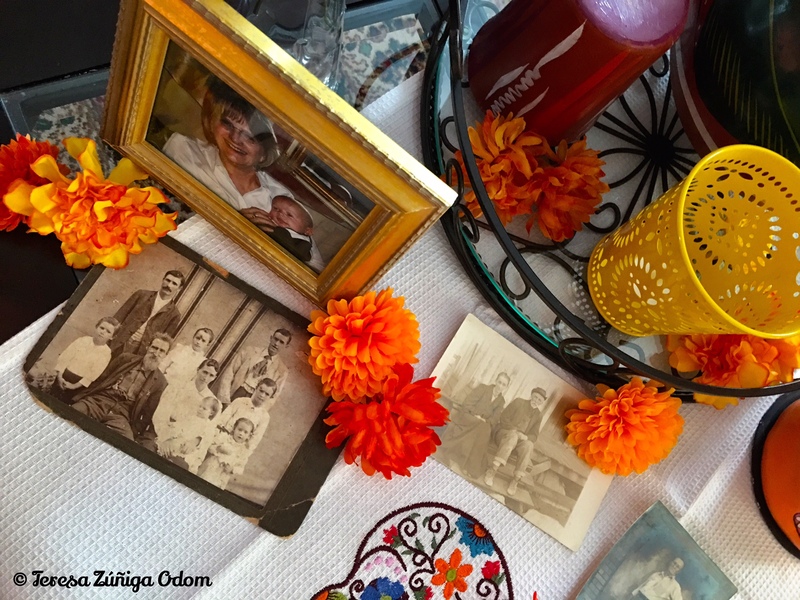 Altars feature photos, food or drink and hobbies of lost loved ones. 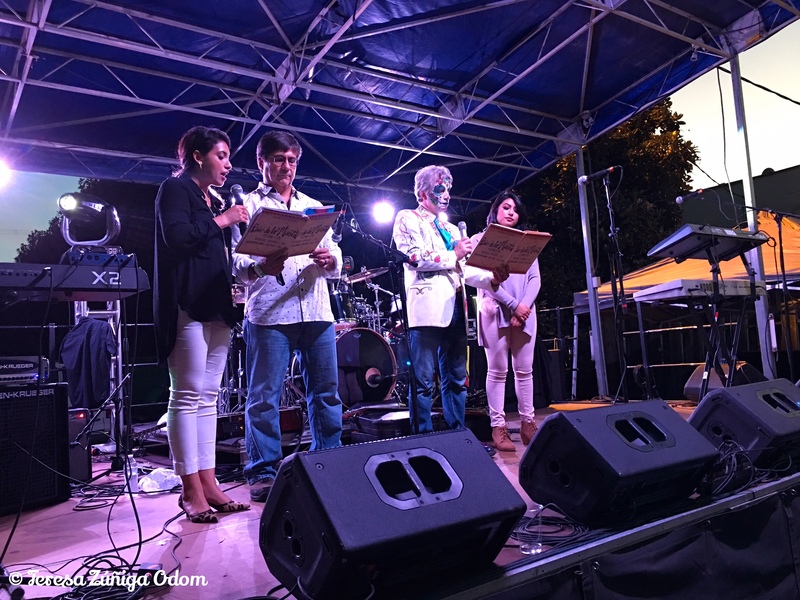 Many Hispanic members of the community have embraced this event and participate as a remembrance of their native country. 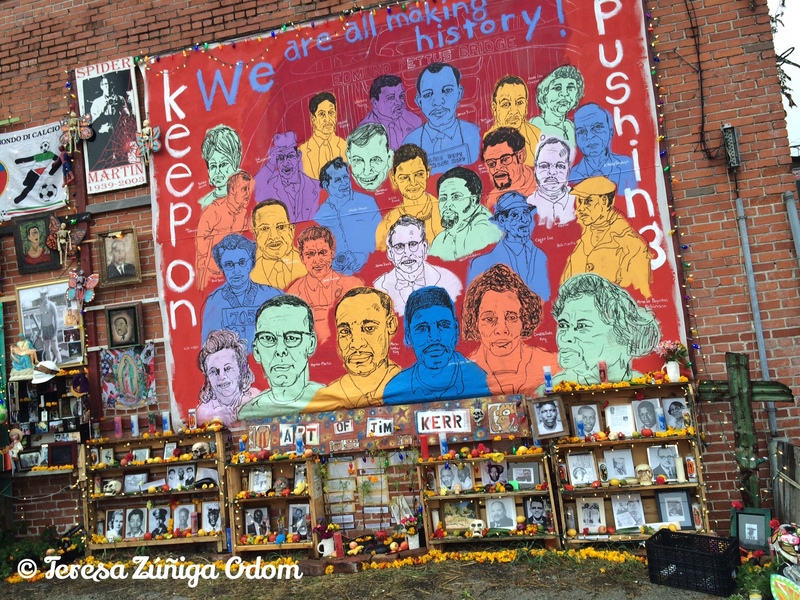 This year, the festival invited visual artist Tim Kerr from Austin, Texas, to create the central memorial. He chose a mural to honor departed foot soldiers of the civil rights movement. It was featured next to the altar honoring photographer Spider Martin. This annual altar is created by his daughter, Tracy Martin – a founder of the festival – and always draws a crowd. 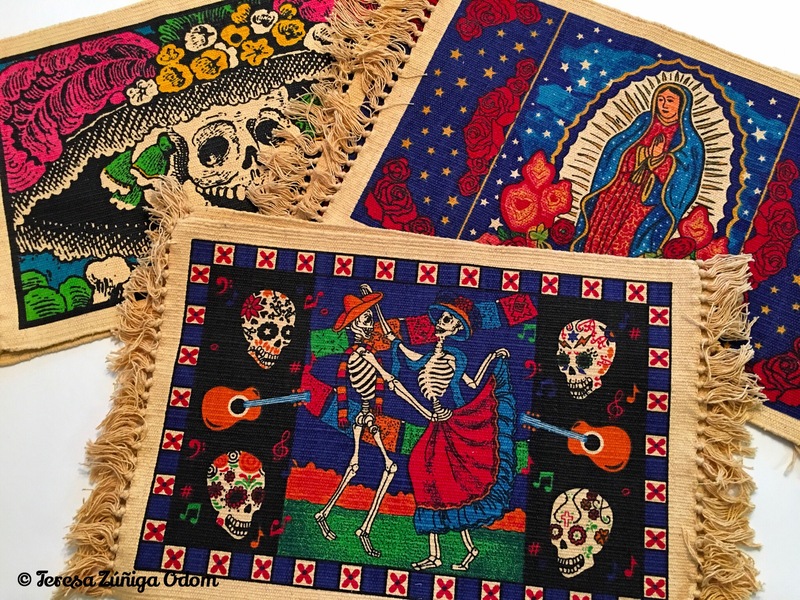 While the festival honors the traditional Mexican Day of the Dead, it incorporates other elements that make it unique. To many Alabamians, it brings to mind Decoration Day in the South. It also gives a New Orleans feel with the jazz funeral parade and procession that takes place around the event. “Dressing up” is a mainstay at the festival. A parade honoring celebrated Mexican artist Frida Kahlo marched along with the jazz band and paraders performed on the main stage. 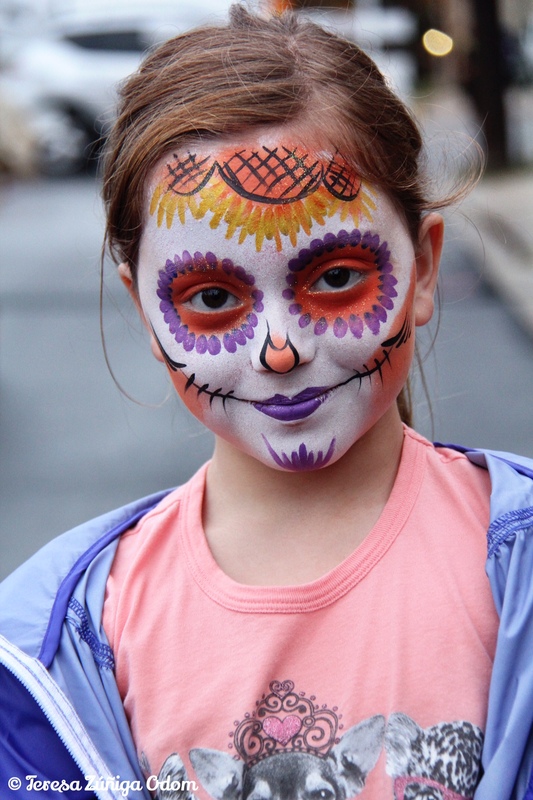 A young girl has her face painted as sugar skull at the festival. 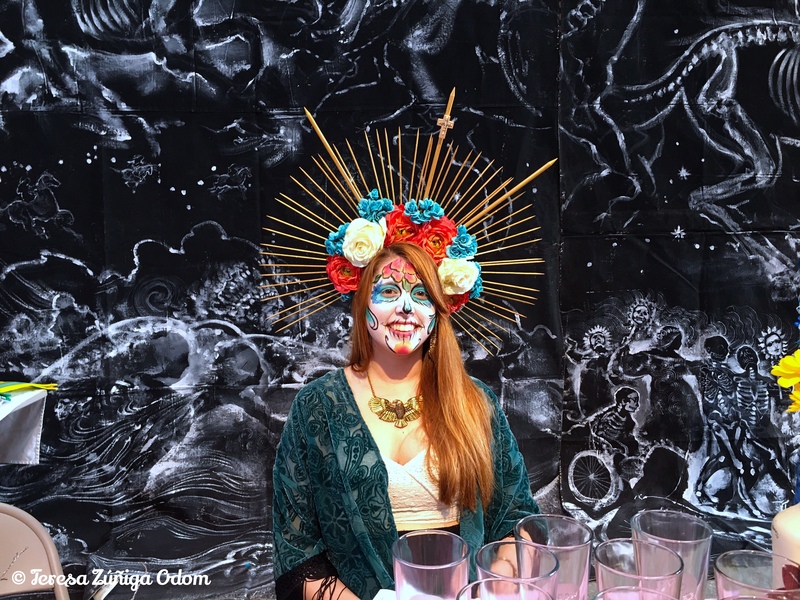 This is one of the most popular things to do at Dia de los Muertos. 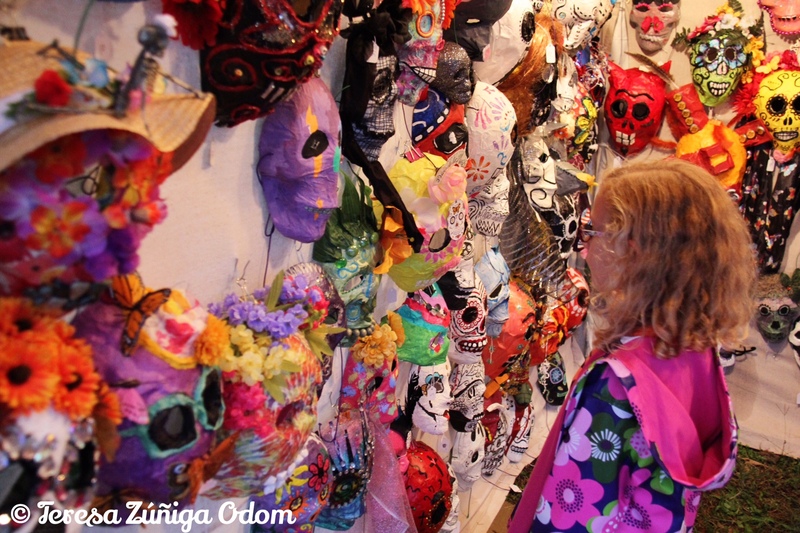 The children’s area provided families with sugar skull or “calavera” crafts, activities and a puppet show. Speaking of sugar skulls, having one’s face painted at the festival is popular and not limited to children. The line to have faces painted was long but the results were praised. 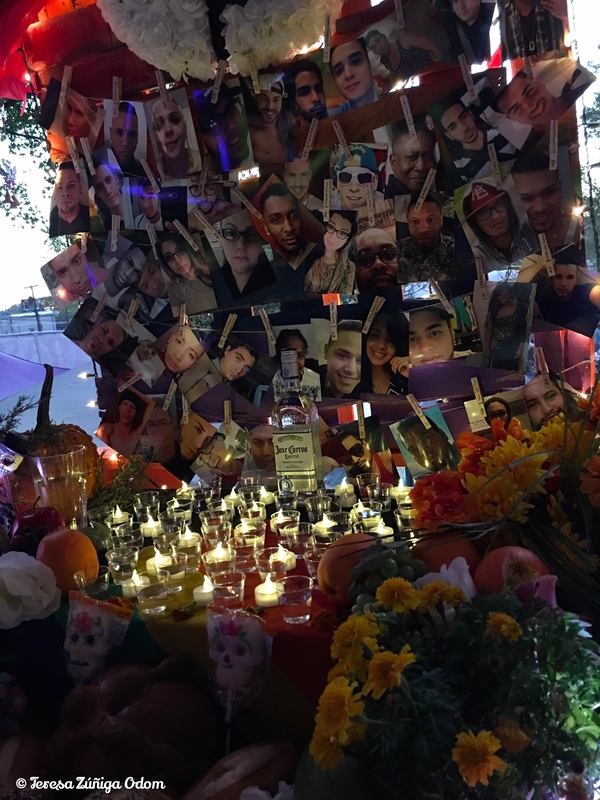 The public altar area provided a place for attendees to bring photos and personal remembrances or “ofrendas” and honor a departed loved one. 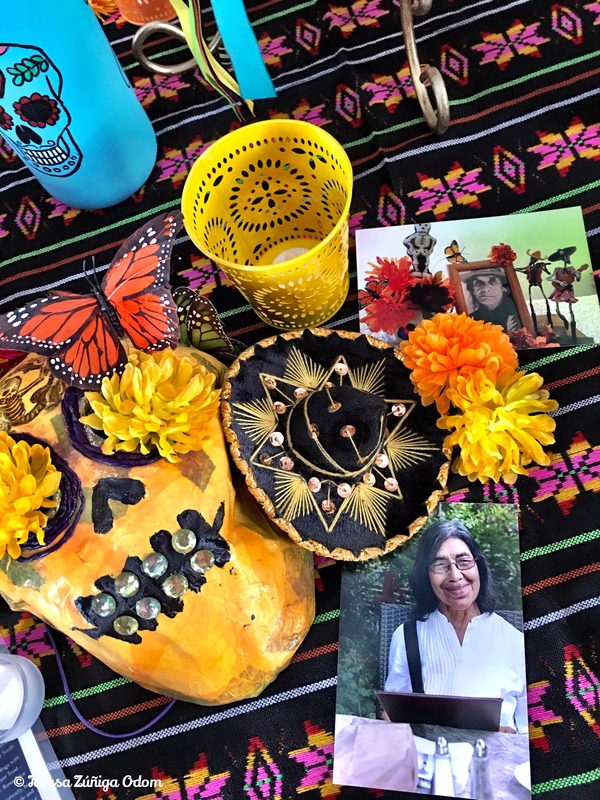 One young woman, born and raised in Alabama, commented that she didn’t know much about Day of the Dead until recently when a friend told her about it. She was looking for a way to pay tribute to her father, who recently passed away, and she was excited to take part in this year’s event. “I want to remember the good times and not dwell on my dad’s death,” she said. 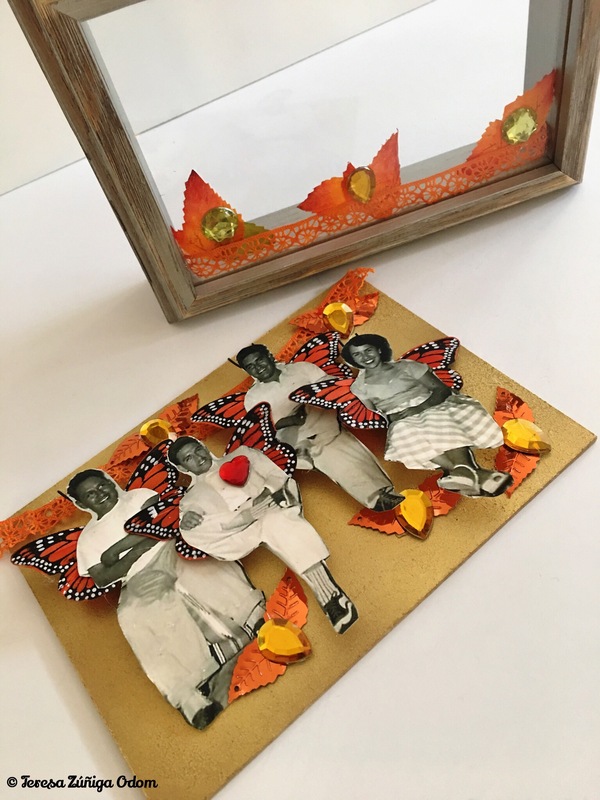 “I think this is why events like this are so meaningful and powerful to people like me.” She held a picture of her father holding her as a baby, and brought his favorite fruit, an apple, to include in the public altar area. Through tears, she remarked how happy she was to be a part of the event. 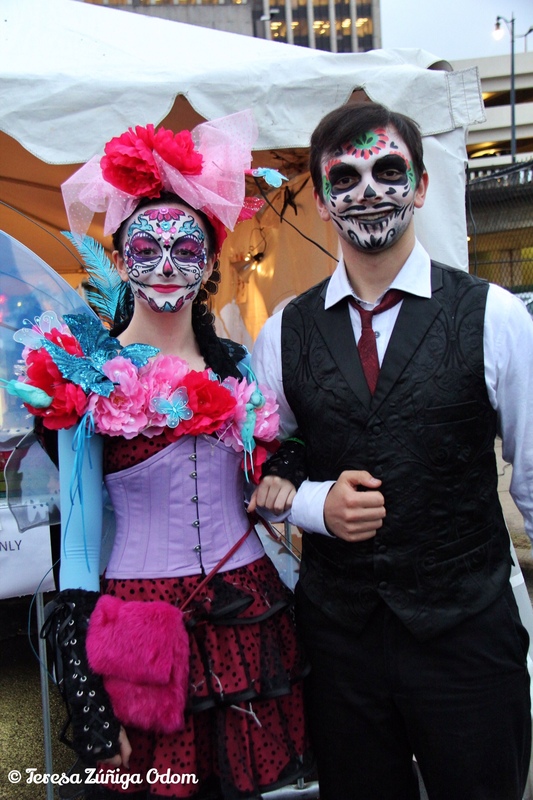 A couple dresses out in full sugar skull makeup and colorful clothing for Dia de los Muertos Birmingham 2015. One of the most heartfelt moments at the festival is the annual roll call. People submit names of deceased loved ones to be called out from the main stage. As names are called, family and friends in the audience hold up pictures of their loved ones. 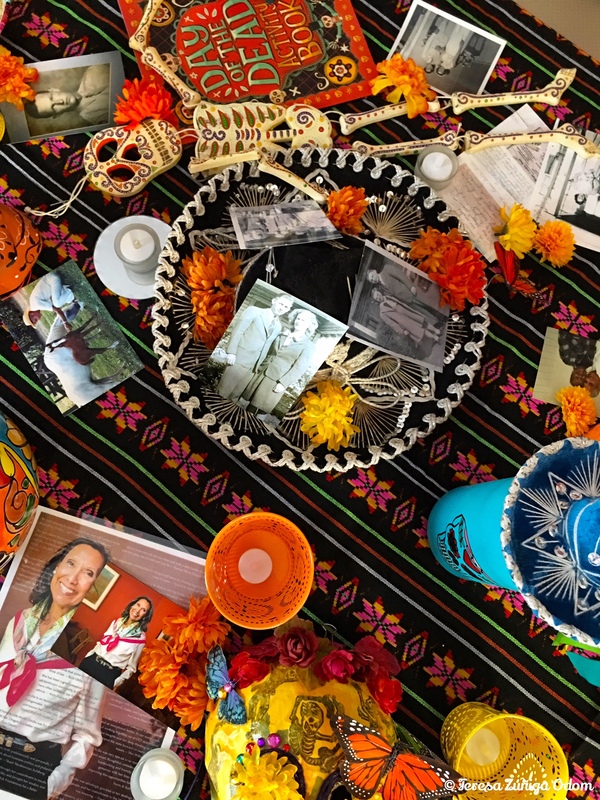 Robert Hernandez, a festival volunteer, created an altar to honor his family as well as Selena, who was known as the Queen of Tejano music before her murder in 1995. His creation of a large white flower was a central feature of his altar highlighted with music from the late artist. Hernandez met someone attending the festival who knows Selena’s family. The friend took pictures and promised to pass them along to her family. 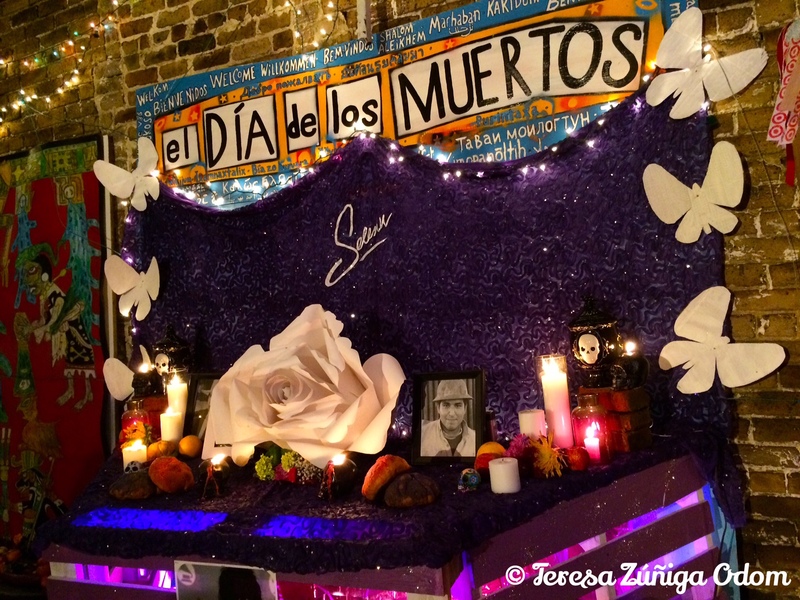 Altar by Robert Hernandez dedicated to Tejana Musician Selena was a popular stop at Dia de los Muertos Birmigham 2015. 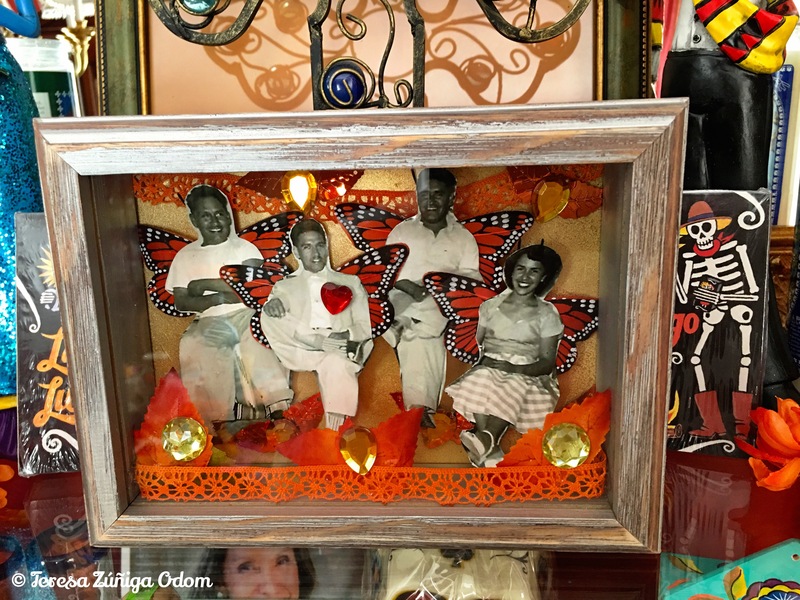 This entry was posted in Bloglikecrazy, Day of the Dead, Dia de los Muertos, Festival, Mexican Art, Photography, Tim Kerr and tagged Bare Hands Inc., Birmingham Alabama, Bloglikecrazy, Hispanic, Latino, Mexican, Ofrendas, Robert Hernandez, Selena, Tim Kerr, Tracy Martin on November 1, 2016 by Southern Señora.